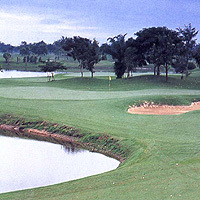 This very popular Jack Nicklaus design features Nicklaus' trademark waste bunkers wide fairways and tight approaches. Course conditions are excellent considering the amount of rounds played. This course provides a good test of golf from the back tees while also being payable by higher handicappers from the forward tees. A local and tourist favourite, The Legacy Club continues to improve all aspects of the golf operations. Close to the city, reachable in 40 minutes even amongst the worst of traffic conditions. Good caddies, friendly staff and striving to get better. Book your tee times in advance, weekends are especially busy because of its location. Use your American Express Card for a special rate.